President says car should be U.S.-built, Ford says it's not profitable. 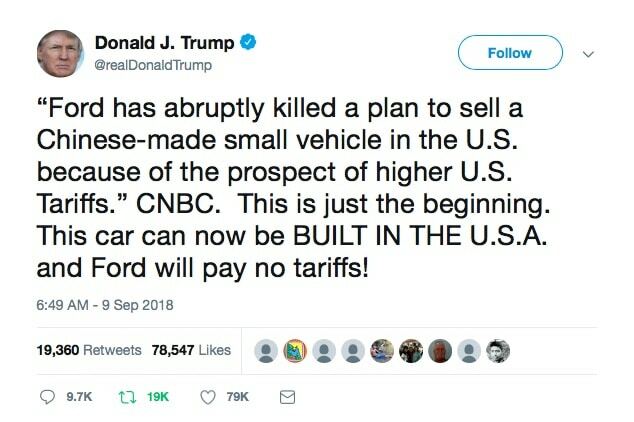 President Trump is tweeting about Ford again, claiming the automaker should build the Focus Active in the U.S.
Ford Motor Co. is back in the twitter crosshairs of President Donald Trump, who claims the automaker should be able to build a vehicle profitably in the U.S. instead of China due to the tariffs he’s put in place. “’Ford has abruptly killed a plan to sell a Chinese-made small vehicle in the U.S. because of the prospect of higher U.S. Tariffs.’ CNBC. This is just the beginning. This car can now be BUILT IN THE U.S.A. and Ford will pay no tariffs!” Trump tweeted Sunday. In late August, Ford announced its was cancelling its plans to sell the Ford Focus Active, a wagon-like crossover built in China, in the U.S. because the 25% tariff Trump instituted on vehicles imported from China into the United States made it unprofitable. 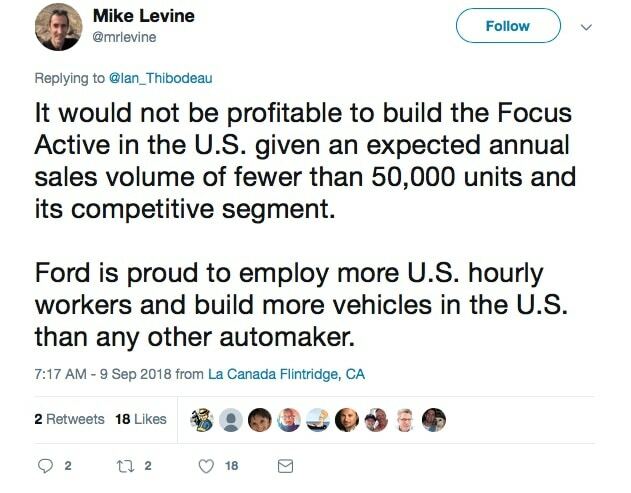 Ford officials, in response to Trump’s tweet, made it known again that the tariff isn’t the only reason why the vehicle wasn’t built in the U.S.
Ford officials tweeted in response to President Trump's tweet that the Focus Active cannot be built and sold profitably in the U.S.
“It would not be profitable to build the Focus Active in the U.S. given an expected annual sales volume of fewer than 50,000 units and its competitive segment,” tweeted Mike Levine, a public relations executive with the automaker. “Ford is proud to employ more U.S. hourly workers and build more vehicles in the U.S. than any other automaker,” he added. The automaker, which earlier this year announced it would no longer sell cars – except the Mustang – in the U.S., is focusing solely on its highly profitable trucks, sport-utilities and crossovers. The Focus Active was part of that plan. Ford stopped producing the Focus sedan at its Wayne, Michigan plant in May and the Focus hatchback is soon to follow. Ford sells the Focus globally, which is what allowed an allotment of 50,000 to shipped to the U.S., according to analysts. During his election run, Trump often targeted Ford in tweets, making claims about the company that were generally inaccurate at best, and completely wrong much of the time. Once in office, he continued to tweet about the company, including once claiming the company shifted production of heavy-duty trucks from Mexico to Ohio because of him. Ford immediately corrected Trump, reminding his followers that Ford had set the plans in motion 18 months ago, including announcing the intended move at the time. This entry was posted on Monday, September 10th, 2018 at and is filed under Automakers, Automobiles, Business, China, Crossovers/CUVs, Executives, Financials, Ford, Markets, Personalities, Politicians, Sales, Sales, Trade, Trends, U.S./North America. You can follow any responses to this entry through the RSS 2.0 feed. Both comments and pings are currently closed. Interesting to note the difference in the number of “Likes” to the tweets of Donald and Mike. Yes. It’s true. The President of the United States has a just a few more Twitter followers than a member of Ford’s public relations team. LOL.